In 1990-91, Bebe Pritam Johnson and Warren Eames Johnson interviewed 14 of these artist-craftsmen who were pivotal to the gallery in its first decade. 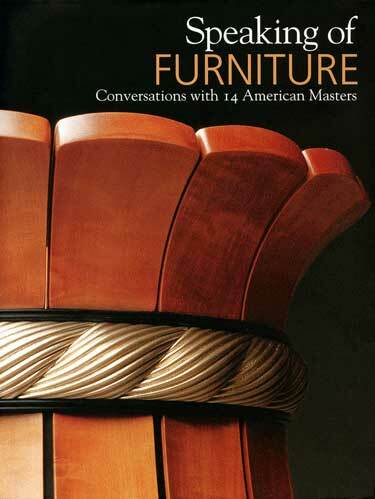 These conversations have been turned into a book, Speaking of Furniture: Conversations with 14 American Masters, which has just been published by The Artist Book Foundation. In their words, James Krenov, Wendell Castle, Judy Kensley McKie, Thomas Hucker, as well as Jere Osgood, Richard Scott Newman, David Ebner, Hank Gilpin, Alphonse Mattia, John Dunnigan, Wendy Maruyama, James Schriber, Timothy Philbrick and Michael Hurwitz tell us why they do what they do and why they chose furniture as a vehicle for artistic expression. The impassioned voices of 14 makers bring to life the issues of the studio furniture field, from isolation to analysis of form to comparison with other arts. Led by the wise questions of the owners of the country’s major art-furniture gallery, their stories create a thought-provoking, sometimes Roshomon-like portrait of the growth and development — and personalities — of this creative movement. It’s an important history and a great read. An engaging history and examination of the studio furniture movement, Speaking of Furniture: Conversations with 14 American Masters is an informative, firsthand presentation of the creative processes of 14 diverse and highly accomplished artisan furniture makers: James Krenov, Wendell Castle, Jere Osgood, Judy Kensley McKie, David Ebner, Richard Scott Newman, Hank Gilpin, Alphonse Mattia, John Dunnigan, Wendy Maruyama, James Schriber, Timothy S. Philbrick, Michael Hurwitz and Thomas Hucker. Through these insightful and wide-ranging interviews, each describes his or her evolution as a furniture maker and reveals a uniquely personal approach to a craft characterized by its delicate and vital balance of concept and functionality. In his foreword, Edward S. Cooke, Jr., provides a succinct analysis of the American Studio Furniture movement and how the individuality of its practitioners contrasts with the constraints and task-specific demands of the traditional furniture trade. Author and furniture maker Roger Holmes offers an insider’s perspective on the art and craft of producing exquisite contemporary furniture in his conversational Introduction and maintains that “art or craft, this is very personal work” while emphasizing “the fundamental connection between hand, mind, and the making of things.” The extraordinary range of exquisite and eclectic works presented in Speaking of Furniture is a feast for the eyes and a testimony to the makers’ professionalism and mastery of their craft. Based in East Hampton, New York, Pritam & Eames is associated with the finest work in American furniture making since 1981. As the country’s oldest established gallery connected with the American studio furniture movement, they represent a distinguished group of artist-craftspeople. Edward S. Cooke, Jr. is the Charles F. Montgomery Professor of American Decorative Arts in the Department of the History of Art at Yale University. He has served as director of the Yale Center for the Study of American Art and Material Culture since 1992 and served as the Chair of the department from 2000 to 2006. Roger Holmes, author and furniture maker, manages a workshop in Lincoln, NE, where he combines traditional handwork and contemporary technology. Author of The Woodworker’s Companion, he has been an editor for Fine Woodworking magazine and has written extensively on furniture and furniture making. Janet Koplos, Co-author (with Bruce Metcalf), Makers: A History of American Studio Craft, University of North Carolina Press, 2010; former Senior Editor, Art in America and American Craft magazine. Cover: Richard Scott Newman, Umbrella Stand, 1984 (detail). Pearwood, ebony, and ormolu, 32 in. high x 14 in. diameter (81.28 x 35.56 cm). Photograph: Northlight Studio.